Published in the South Kent Gazette, 5 March, 1980. On the east side, facing the Grand Shaft, there were no less than four public houses—the “Mitre,“ the "Lord Roberts,“ the “Duke of Cambridge“ and the “Duke of York." These houses were attacked by the Dover Temperance Council in 1895 when it was hoped by the precedent of the Sharp and Wakefield case, to get some of them closed on the ground .that they were not all needed by the general public. Mr Boulter, a chimney sweep, who lived next door to the "Duke of Cambridge,“ was the nominal objector. Owing to his objection, the “ Duke of Cambridge “ licence was refused at the Dover Licensing Sessions, but, on appeal to the East Kent Quarter Sessions, the licence was renewed, and Mr Boulter was ordered to pay the costs. Backed by the Temperance Party throughout England, Mr Boulter appealed against that order, and the case was carried, in his name, through all the superior Courts to the House of Lords, when he succeeded on the question of costs. Mr Boulter, who was an aged man at the time, died in 1898. “The Duke of Cambridge" was closed in 1912; “The Duke of York“ went six years earlier; “The Lord Roberts“ in 1913; whilst “The Mitre“ crossed the road when alterations were made in 1930. 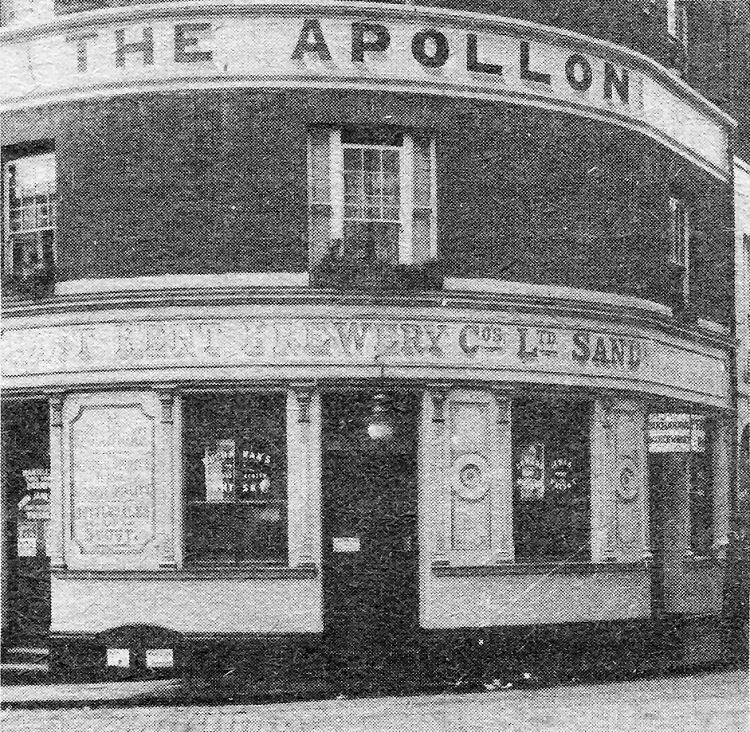 A popular Snargate Street landmark which disappeared with the widening was the “Apollonian,“ the site of which was at a corner of Snargate Street, opposite Messrs Clout’s who were at Nos. 134-6, close to where Dover Printing Company and the Masonic Hall exist to this day. This was a public hall, established about 1846 by Mr Henry Stone. He was, in early life, a confidential servant of the Fector family. The Apollonian Hall and the Wellington Hall, further up the street, were the regular places for holding political meetings, concerts and lectures until the town hall was built at the Maison Dieu in 1883. Mr Stone was for many years a town councillor for the Pier Ward, and afterwards an alderman. For many years the Dover Catch Club held its winter season concerts at the Apollonian Hall. This Club was established in 1784, and continued in existence for over 100 years. In latter years it always met at the Apollonian, but earlier it had various homes, including the “Royal Oak“ Assembly Rooms in Cannon Street. This is another street that has been greatly altered since the first edition of this book was published, the whole of the side furthest from the cliff being demolished in connection with the Pier Improvement scheme authorised by the Dover Corporation Act of Parliament of 1912, which provided for the closing of various level crossings on the route to the Admiralty Pier by Strond Street and the Quays and the construction instead of a viaduct carrying a 60ft. road from Snargate Street to the Lord Warden Hotel. Included in this scheme was provision for the widening of Limekiln Street and Bulwark Street, and the transfer of a big area to the Railway Companies, who contributed £40,000 towards the construction of the viaduct, which only recently was rebuilt to withstand the heavier vehicles and greater volume of commercial traffic of today. Limekiln Street leads in a direct line from the bottom of Snargate Street to the junction of Bulwark Street and Bulwark Hill, or Archcliffe Fort Road, to use the more modern name. Its history as a public thoroughfare begins with the opening of the 16th century. Until the reign of Henry VII, the ebbing and flowing tide held possession of the undercliff, and that ancient highway, which is now called the “Old Folkestone Road,“. which is the continuation of Limekiln Street, had not been brought into existence. In more recent times all the original properties on the landward side have been swept away. It may be asked: “Where was the main road leading to Folkestone in the old days?“ There does not appear to have been any main road, in accordance with the present meaning of the word. In that direction, both East Kent and the whole of West Kent was served with a labyrinth of lanes, only intended for local use. Travelling was then mainly done on horseback, and merchandise carried on a pack saddle. In that way, it was quite possible to make the journey from Folkestone along the cliffs and, on reaching Shakespeare’s Cliff, cross the Western Heights to the Priory; in fact, ancient prints show a hillside track leading from the back of Shakespeare’s Cliff over the Western Heights to Cowgate. There was a good deal of traffic between Dover and Folkestone, in the matter of stone for building Dover Harbour and the Dover walls, but that came by water. There was a roundabout way to Folkestone, past the Priory and through Elms Vale, and another was up the London road and over Swingfield Minnis. The only road from Dover to London was the Canterbury road; and Folkestone, in those days, scarcely ever saw any Continental travellers. The Old Folkestone Road, via Archcliffe, was made a turnpike in 1763, and it was dis-turnpiked, and the present Folkestone Road made in 1783. Some time in the reign of Henry VII unusually large quantities of pebbles were carried round Archcliffe Point, and created a head, behind which the Dover mariners moored their boats. The pebbles which formed the head subsequently began to work round the point and choke up the little bay. Then Sir John Clark, the Master of the Maison Dieu, felt called upon to lend a hand to the mariners. With certain help from Henry VII, he extended the head, and the shelter thus provided was called “Little Paradise.“ Later, Henry VIII lengthened it much more, and a small enclosed basin was formed just where Paradise Street, Oxenden Street, Hawkesbury Street and Spring Place were until 1912. Among the most valuable of old engravings of Dover are those by Hullmandel and Nathaniel and Samuel Buck. 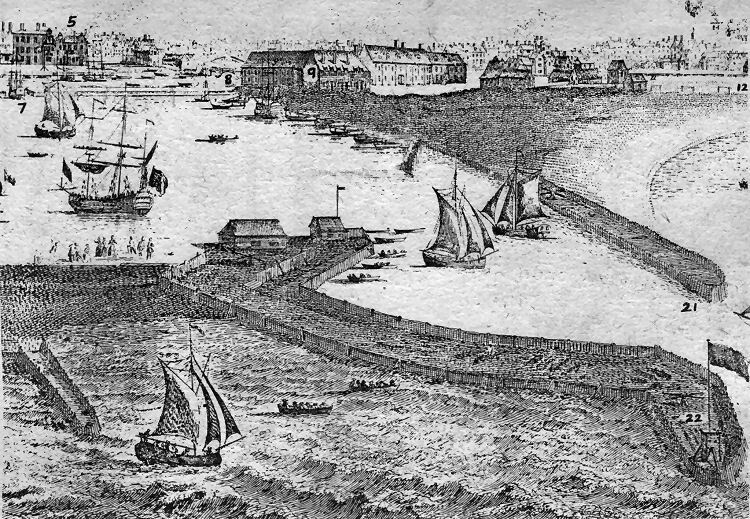 This interesting view of the western docks, dated 1739, is a small section of a Buck print which is 30in wide. Interesting features include the old North (21) and South (22) Piers: the old Customs House (5) on Custom House Quay, now the site of Hammonds’ warehouses overlooking the Granville Dock, then called the second or inner basin, which is being entered by a sailing ship (7); the massive looking Almshouses (9) on what we call Union Quay today; the old drawbridge entrance (8) to the old Pent, which Is now known as the Wellington Dock; and the old Ropewalk (12) which ran along the length of Marine Parade. The picture, above is of the old East Kent Brewery’s Apollonian Hall and public house which was an extremely popular feature of Snargate Street before the widening of the late 1920s and early 1930s, (referred to in Part 58).